Sit on your deck and watch the river flow by from this riverside cabin. Cabin 107 and 108 are a duplex and would work well if you were to rent both units at once in order to have family and/or friends located side-by-side. 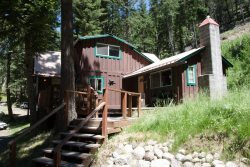 This cabin is also located on the Flying Arrow Resort property and is near many other cabins including 101-112, Minnow, and Fawn, so other families could stay close by. This cabin has a nice deck with a great view of the river and the mountains! It is in a great location for a family with kids because it is near the go carts, horse riding, miniature golf, and more! Come stay in this cabin and enjoy all the great views and activities in this incredible area!